We didn't get a new verision of Android at Google I/O, but it's not like there weren't enough already. As Apple pushes on into the beautiful iOS 7 future and brings the lion's share of its user-base along, there's still a lot of Android users stuck in a multiple OS-ghettos. Apple's walking into the launch of its new iOS7 with a whopping 93 percent of users on the current operating system, with virtually everyone else just one version behind. 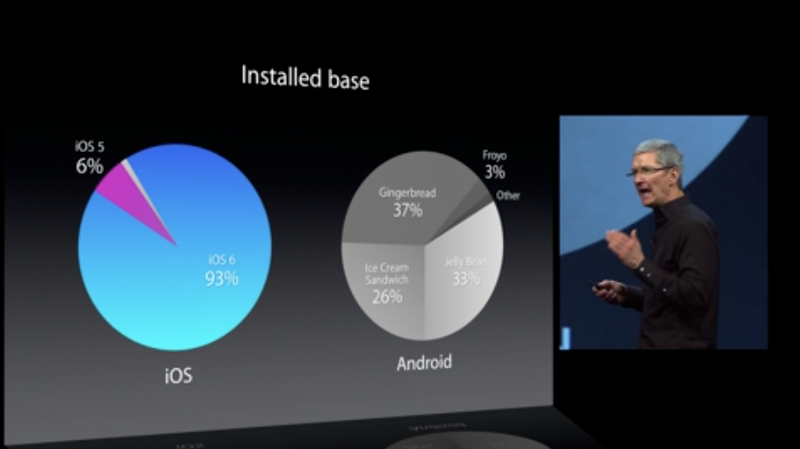 Android on the other hand is almost an even split between current versions and the past two. It's this kind of unified user base that really gives Apple an edge especially when it's diving into a brave new design world like iOS 7. Meanwhile, kids in the Android slums weep silent tears onto Gingerbread screens.